I’m always on the hunt for a good fish taco. Living in Florida I can pretty much find fresh fish tacos in every restaurant. I’ve tried so many different versions of fish tacos, I lost count. Eating out all of the time can get pretty expensive though, so now I’m making my own fish tacos at home. Since Tilapia was on sale this week, I decided to use this fresh fish for my tacos! 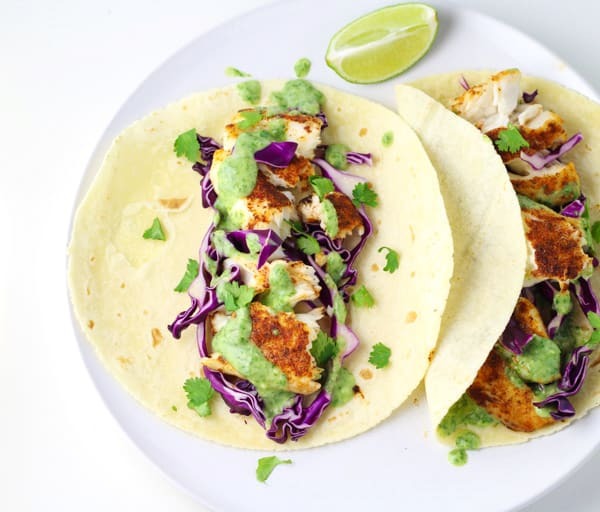 Tilapia is perfect for fish tacos, I actually think it’s the most common fish used for tacos in restaurants. It’s relatively a cheap fish to buy and it tastes delicious! Tilapia has a sweet, mild flavor and has a medium-firm flakiness to it, which to me is absolutely perfect! Mix the seasoning together and sprinkle over both sides of the fillets. Spray a baking sheet with Coconut Oil (I like the flavor of this best, but you could use any kind of non-stick spray). Bake at 400 degrees Fahrenheit for 20 minutes (flipping half way through). 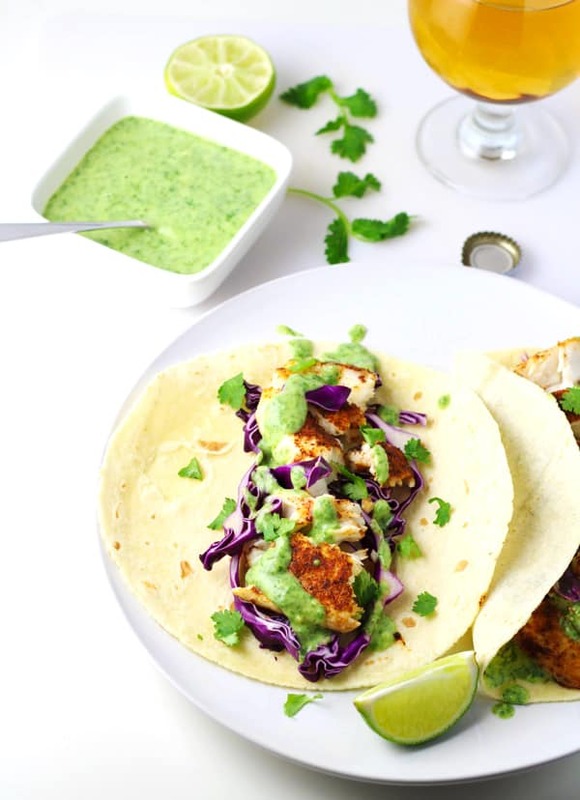 While the fish is cooking you can make the yummy Avocado Cilantro Sauce! Add all the ingredients to a Food Processor or high speed blender and pulse or blend for about 30 seconds until it’s fully mixed. 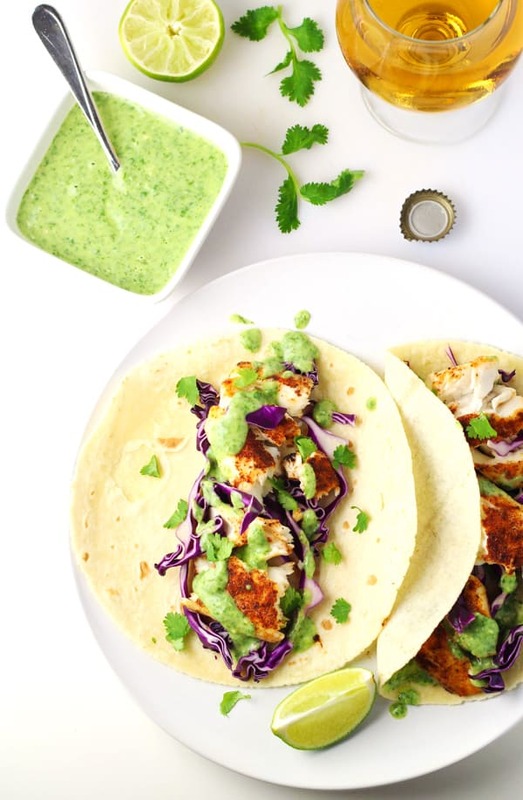 Drizzle this sauce over the fish tacos and proceed to chow down! I also added some shredded Purple Cabbage and Avocado slices on top of of the tacos as well. You could add any of your favorite toppings to this though. Place Tilapia fillets on baking sheet. In a small bowl mix together Chili Powder, Garlic Powder, Onion Powder, Oregano, Cumin, Salt, and Pepper. Sprinkle seasoning evenly over each side of the fillets. Bake 20 minutes flipping the fillets half way through. While the fish is cooking prepare the sauce. 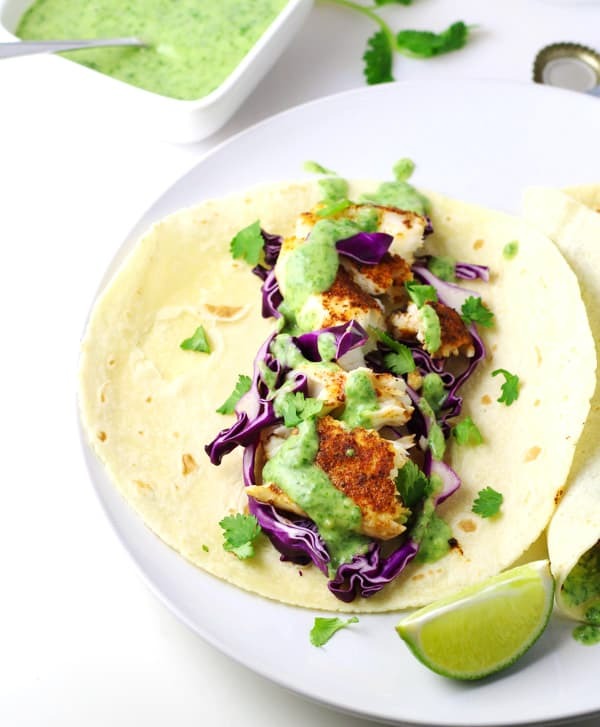 In a food processor or high speed blender add Avocado, Yogurt, Cilantro, Lime Juice, and Salt. Pulse or blend for about 30 seconds until combined. 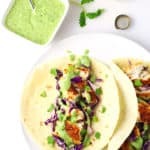 To each Corn Tortilla add Slaw, Tilapia, and drizzle the sauce over. Fish tacos are my favorite kind of tacos! Definitely gonna try this recipe a try soon. Thanks for sharing.